If I couldn’t live without one hot plant group right now, it would be succulents. Their luxurious textures, shapes, and colors offer the bold structural look that no other plant group can. 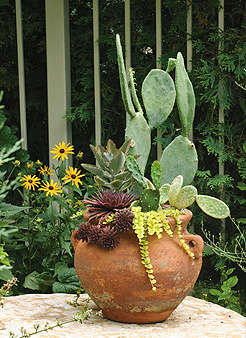 A plethora of succulent species thrives in containers, allowing for a great diversity of options to play with. No better place to appreciate these qualities than at an intimate seating area where one can take it all in at close proximity. I like creating succulent gardens as virtual landscapes in miniature—perfect for outdoor dining tables, centerpieces, or seating areas. Plus, who wouldn’t like their low-input care and forgiveness for neglect. Under usual summer conditions, normal rainfall is enough to keep these drought-tolerant beauties happy—no additional irrigation needed. This makes long weekends to the cabin or out-of-town carefree without troubling a neighbor kid or friend to take care of your plants. Succulents are easy, but need the sun in order to thrive. They absolutely love summer vacations outside by themselves, or mixed in with other succulents, basking in the sun. When winter nears, I bring mine inside with me, placing them in the sunniest part of the house—helping to make even the longest Minnesota winters a bit more tolerable. Just like any type of gardening, a bit of editing will keep your succulent collection in tip-top shape. If something begins to look a bit scrappy or overgrown, simply prune back the more aggressive plants to allow the little guys more space to grow, and replace nonperformers with something new. I became addicted to collecting and growing succulents years ago. It’s a healthy addiction I have no desire to give up. Thankfully, we add more and more varieties of succulents each year to our offerings at Tangletown Gardens to feed our own penchant for this fun plant group, while supplying our guests with virtually guaranteed carefree success when growing them. Scott Endres is co-owner of Tangletown Gardens and Tangletown’s Wise Acre Eatery on 54th and Nicollet in South Minneapolis.